Howard's original Garden City concept. Since the beginning of the twentieth century, the evolution of modern urban planning has been marked by a high level of transnational learning and cooperation. In this context, the International Federation for Housing and Planning (IFHP) has established itself as an important international institution, providing a forum of exchange for architects and planners from around the globe. The IFHP incorporates professional institutions and individuals of many signatures active in the broad fields of housing, urban development and planning. The roots of the federation lie in the British Garden Cities Association (GCA), founded in 1899 by prominent author Sir Ebenezer Howard. Howard was the initiator of the garden city movement, which has exerted significant influence on numerous international architectural and planning developments. It quickly traveled across the Atlantic and its influence is visible today in the United States in planned communities such as Radburn, New Jersey, Greenbelt, Maryland, and Norris, Tennessee, which was constructed by the Tennessee Valley Authority (TVA). 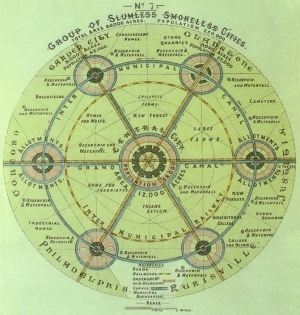 The IFHP, originally called International Garden Cities and Town Planning Association, served as the international branch of the garden cities movement. It was specifically designed to further promote Howard’s concept of housing and planning and to improve the general standard of the planning profession. Especially in the early decades of the 20th century the IFHP was an important forum for exchange and a vital element of the international success of Howard’s ideas. The Federation went through several name changes before it settled for the title IFHP in 1958. In 1922 it adopted the name International Garden Cities and Town Planning Federation, from 1924 on it carried the name International Federation for Town and Country Planning and Garden Cities, only to change the name again in 1926, becoming the International Federation for Housing and Town Planning. This adjustment exemplifies the evolution of the Federation from a specialized organization of the garden city movement to an institution connecting individuals engaged in a wide array of housing and planning themes. In the research context, the most important part of the IFHP’s work are the international annual congresses devoted to certain topical themes. Since the 1920s, they show which topics were considered of global importance in the planning world and offered the opportunity for planning professionals to get in touch with colleagues from foreign countries. Unfortunately, our knowledge about the way the IFHP functioned as a network for the international development of urban planning is limited. For readers of Italian, Renzo Riboldazzi offers information on the development of the congress agenda during the interwar period. No other books have been published about the IFHP. However, Michel Geertse is conducting promising research on the networking aspect of IFHP as part of a project on the Urban Nebula. Hall, Peter G. Cities of Tomorrow. An intellectual history of urban planning and design in the twentieth century. Oxford, 2002. Howard, Ebenezer. Garden Cities of To-morrow. London, 1902. Renzo Riboldazzi. Un'altra modernità. L'IFHTP e la cultura urbanistica tra le due guerre, 1923-1939. Roma, 2009.